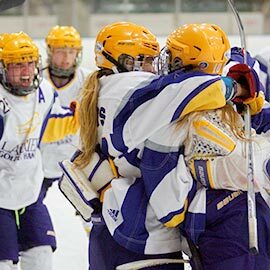 For Laurier’s varsity athletes, the end of February means one thing: playoffs. Several Golden Hawks squads are either in the midst of playoff runs or set to start their post seasons. You can follow the Golden Hawks through the playoffs at laurierathletics.com. Laurier’s men’s and women’s curling teams recently swept the Ontario University Athletics (OUA) championships, both winning gold medals. The men’s team, led by skip Andrew Squires, topped Western in the championship game, while women’s skip Carly Howard led her squad to the provincial title, beating the Brock Badgers for gold. This is the second time in Laurier history that both Golden Hawks curling teams have won provincial championships in the same year, the last time in 2008. Both teams will now compete at the Canadian Interuniversity Sport (CIS) championships, which Laurier is hosting, March 18-21 at the K-W Granite Club. The Golden Hawks women’s hockey team met a familiar foe in the first round of the OUA playoffs – the Queen’s Gaels, the team Laurier beat for the provincial championship last year. After a triple-overtime win and a come-from-behind victory, the Hawks swept the best-two-of-three series, upsetting the Gaels, who were ranked sixth in the nation. Next up for the Hawks is a semi-final matchup with the Western Mustangs, the third-ranked team in Canada. The Hawks lost the first game of the series 3-1 Feb. 25 in London. Game two is scheduled for Feb. 27 in Waterloo; if necessary, the third and deciding game will be March 1 in London. Laurier’s men’s basketball team opened the playoffs with a 90-82 upset win over the Western Mustangs in London Feb. 25, lifting the Hawks to the second round of the OUA post season. Following a 7-13 regular season, the Golden Hawks finished third in the OUA West division, while the second-place Mustangs finished 12-8. The Hawks' next matchup will be Feb. 28 in Toronto versus the Ryerson Rams. Following the best regular season in team history, Laurier’s women’s basketball team will host the Queen's Gaels Feb. 28 at the Athletic Complex in their post-season opener. The Hawks’ 17-3 season – which set a team record for most wins in a season – earned them a bye through the first round of the playoffs. The 2014-15 season saw the Golden Hawks set another team record with 12 straight wins, breaking the previous mark of eight. They also reached as high as No. 5 in the CIS national rankings, the highest a Laurier women’s basketball team has ever been ranked.